New Providence Schools recently celebrated Pi Day . Pi is an irrational number starting with the digits 3.14159…. It never ends nor does it repeat in any pattern. The Greek letter ð is the symbol representing the ratio of the circumference of a circle to its diameter. 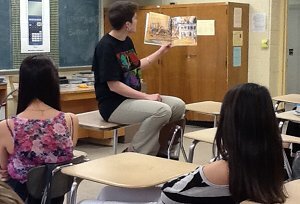 At the middle and high school, teachers read pi stories to their classes. Titles included Sir Cumference and the Great Knight of Angleland and Sir Cumference and the Dragon of Pi, both by Cindy Neuschwander. 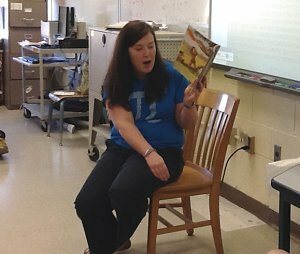 Students watched videos of others reciting digits of pi, sometimes up to 370 digits. Some classes actually calculated pi using a variation of Buffoon"s Needle. Buffon"s Needle is one of the oldest problems in the field of geometrical probability. First stated in 1777, the simulation involves dropping a needle (or frozen hot dogs) on a lined sheet of paper to determine the probability that the needle will cross one of the lines on the page. The remarkable result is that the probability is directly related to the value of pi.